You all asked for it, so here it is! 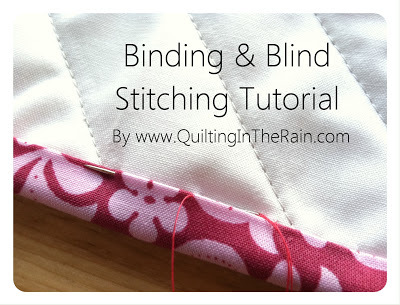 A binding/blind stitching tutorial just for you. 🙂 Thanks for your patience…though binding is something I do regularly, this tutorial took a lot of thought. I try to stay away from posting lengthy and wordy tutorials, so I tried my best while still trying to depict everything clearly. 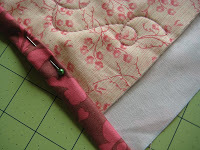 Part I of this tutorial is how to attach the binding to your quilt top, and Part II is how to blind stitch. I made videos of me blind stitching in hopes it would be easier to learn. Also, I wanted to say that I’m a self taught quilter, therefore my way of binding and blind stitching might not be as traditional. But it’s how I roll, and it works! 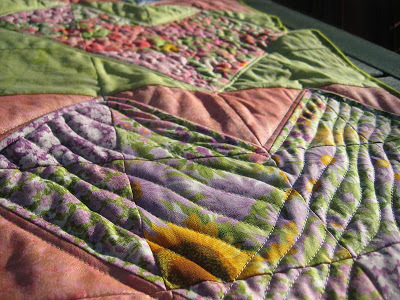 There are many ways to bind a quilt, and this is just one of them. One last thing (so much for not wanting to post wordy tutorials :-p), this tutorial is just one way to bind. 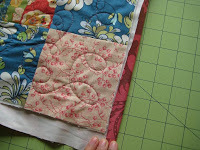 Check out my Quick Quilt Binding Tutorial for an alternative method. 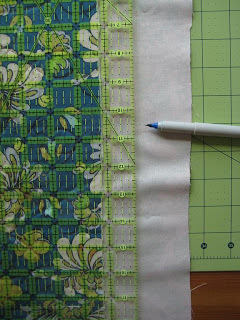 Update: If you prefer not to blind stitch the back of your binding and would rather machine stitch it, check out my Machine Binding Tutorial. 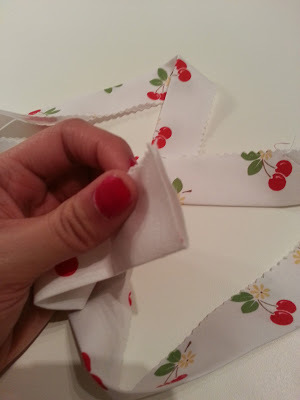 Note: This tutorial assumes a 1/4″ seam allowance. Start and end all stitches with a back-stitch. 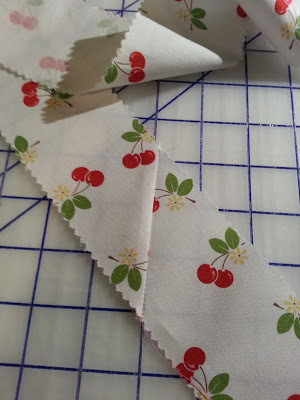 Step 1 – Start by cutting 2.5″ strips from the length of your fabric. If your binding fabric is less than or equal to 1 yard, then typically the length of your fabric will be about 40-44″. 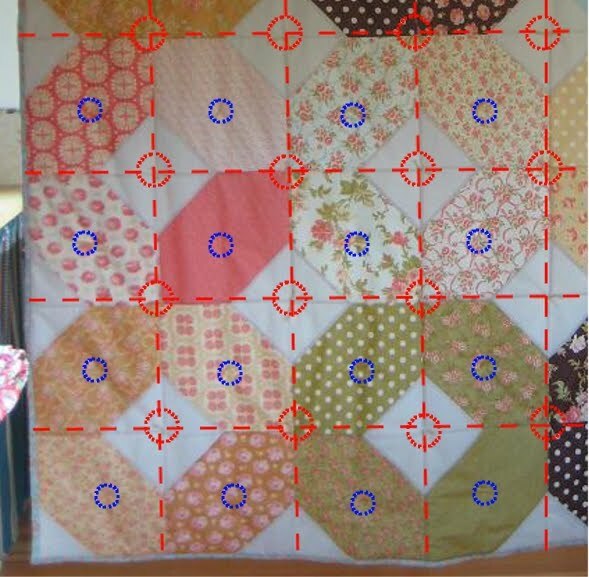 You can divide the total perimeter of your quilt top by 40″ to calculate how many 2.5″ strips you will need to cut (example: if the total perimeter of the quilt top is 120″, then you will need 120″/40″=3 binding strips). 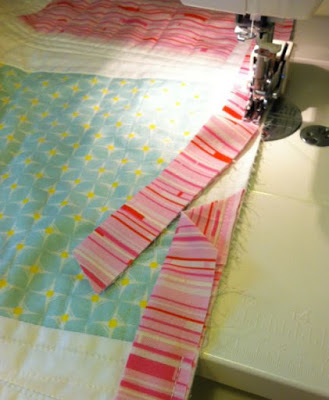 As shown below, sew the strips together to create the length of binding you will need to bind the perimeter of your quilt. To do this, align two strip so that they are perpendicular to one another with the right sides facing each other. 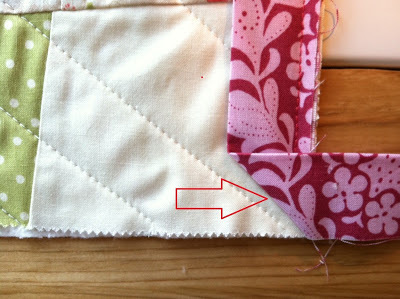 Sew a diagonal line from the bottom left corner to the top right corner as shown below. Step 2 – With an iron, press the binding in half lengthwise so that the width measures 1.25″. 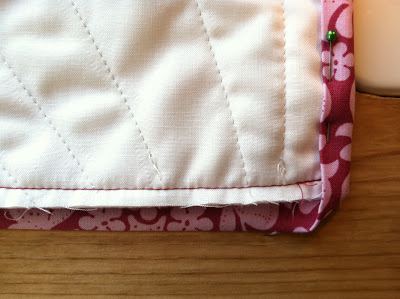 Step 3 – On one end of your binding, create a 45 degree angle seam: a) Open up the binding on one end. 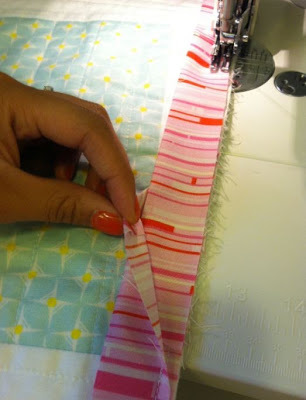 Create a 1/4″ seam by folding the fabric over 1/4″ at the top, then press. 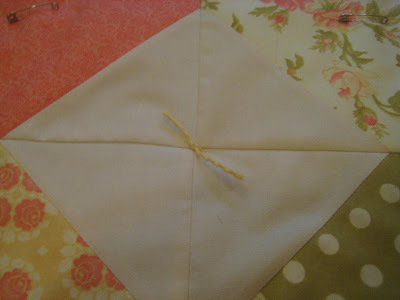 b) Fold the top left corner down to form a 45 degree angle, press. c) Press in half lengthwise. 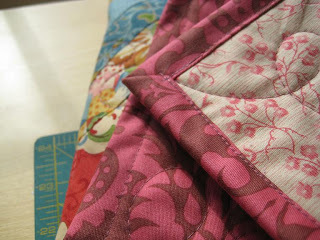 Step 4 – Start binding along the side of your quilt top and away from all corners. 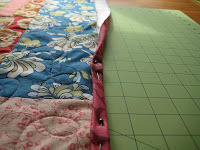 As shown below, attach the binding to your quilt top by opening the binding, and then sewing through the first layer. 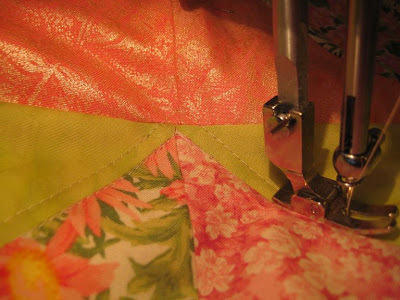 Make sure you start with the end that has the 45 degree angle seam (from the previous step). From the top of the binding, sew 4-5″ down. 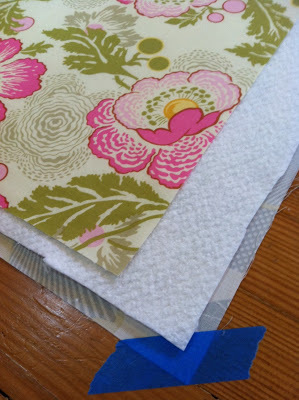 Step 5 – Close the binding so that you can no longer see the 4-5″ that you previously sewed. 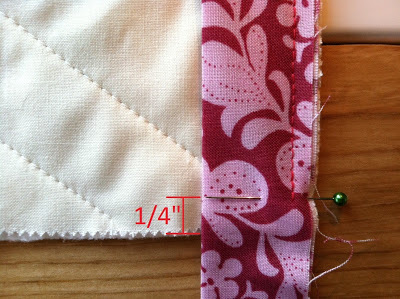 From the top of the binding, measure about 3″ down and start sewing (as depicted with the black arrow below). You will overlap with the previous stitch by at least 1″. This will leave you with an open ‘pocket’ at the start of your binding that’s about 3″ long. a) Stop sewing 1/4″ from the bottom of the corner. End your stitch with a back-stitch. 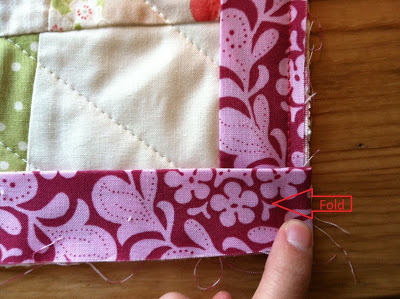 b) As shown below, fold the binding over so that it’s in line with the edge of your quilt top. 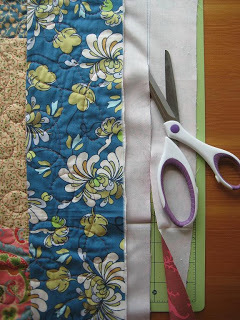 c) Then fold the binding over again but in the other direction; still make sure the binding is in line with the edges of the quilt. …and then start sewing again from the top of the fold to stitch it down. 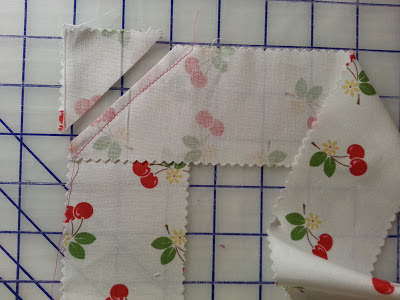 Continue sewing and repeat Step 6 for all corners. Step 7 -When you get to the end, you will come upon the open ‘pocket’ from Step 5. Tuck the unfinished end under the flap as shown below. And then continue sewing to stitch it closed. 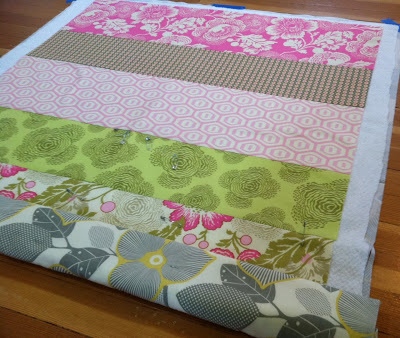 Update: If you’d rather machine bind, please see my machine binding tutorial. 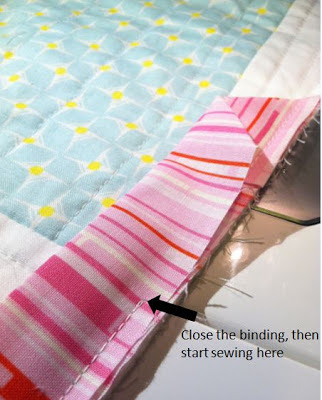 Now that you’ve finished attaching the binding to your quilt top, the last part is to blind stitch the binding to the backing of your quilt. 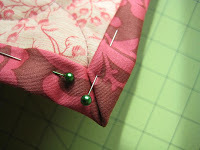 Start by folding the binding over to the back, and pin it to the backing of your quilt. 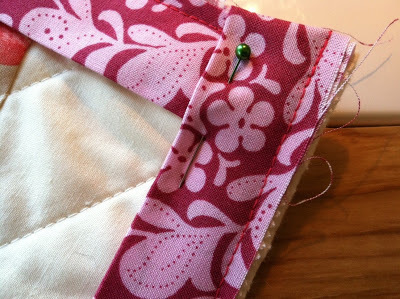 When you get to the corners, simply fold the bottom edge of the binding straight up and then pin the corners down to keep everything in place. 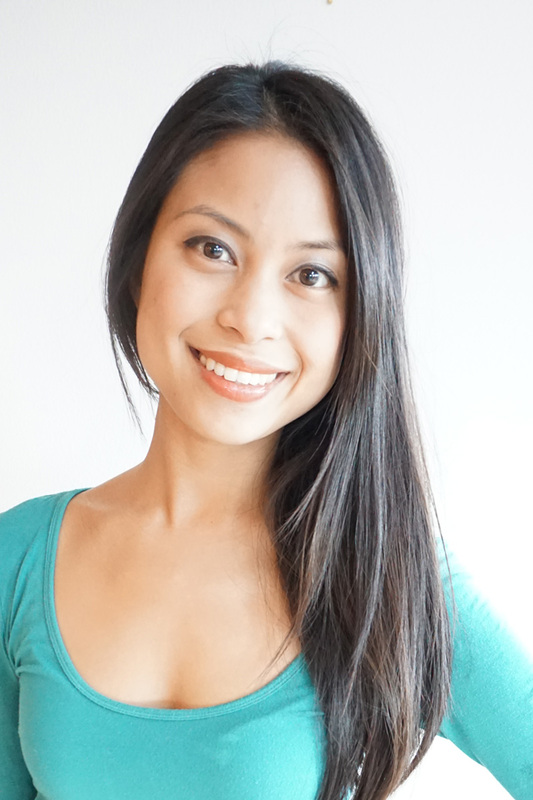 I made three videos showing how to blind stitch…it was just too hard trying to show it via photo. 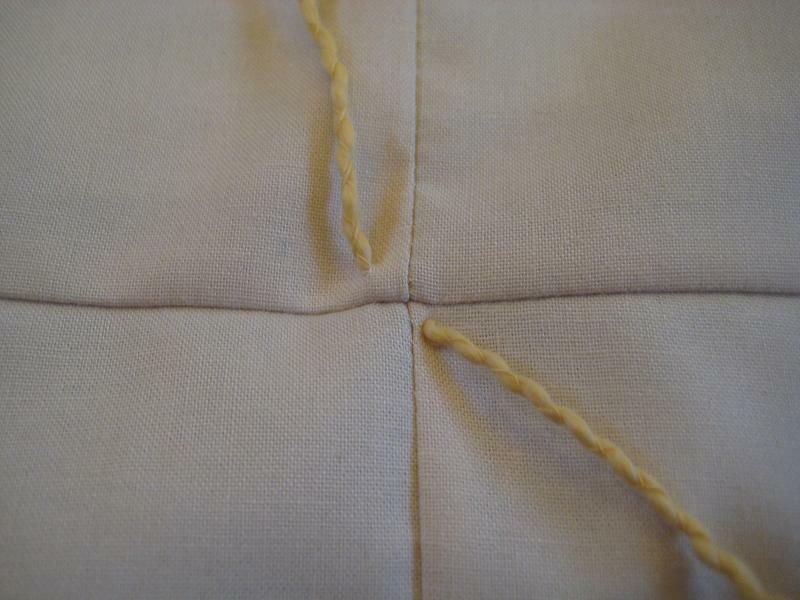 When blind stitching, use a strong thread that won’t break. 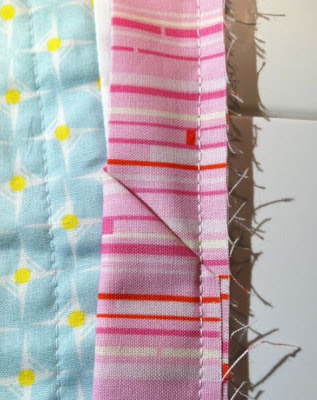 The last thing you want is your thread to snap halfway through blind stitching your entire quilt! 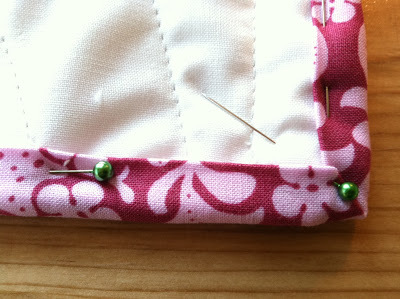 For the purpose of the tutorial, I used a thick and bright pink flossy thread so you can easily see me blind stitching. 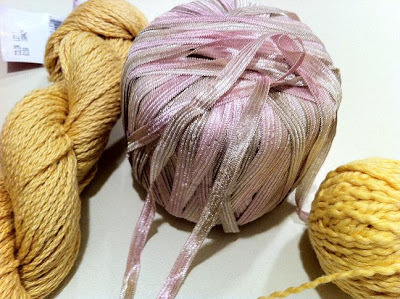 Video #1: This first video shows how you start the blind stitch. 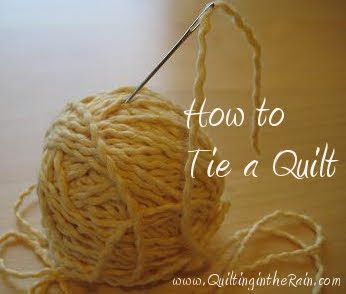 I typically start with at least three feet of thread and tie a knot at one end. 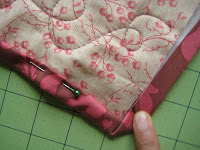 Start by hiding the knot underneath the binding as shown in the video. 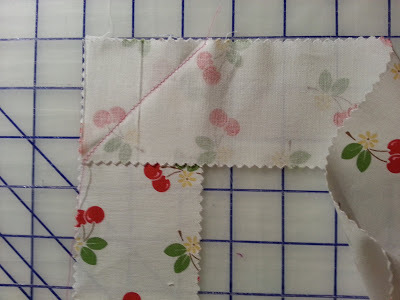 And remember, when blind stitching the thread should never show on the quilt top (it should stay in between the backing fabric and batting). 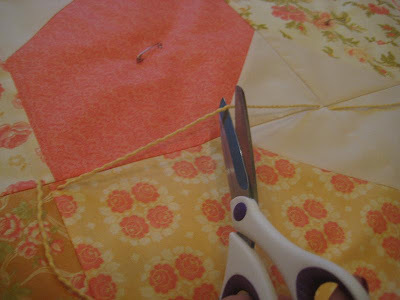 Once the knot is secure, your needle should come up from the quilt backing and nick the edge of the binding, and then come straight back down from where you came up. Then, come back up again but roughly 1/4-1/2″ away from where you originally started. Repeat. Update: Here’s a 3-step picture tutorial on how to start and end a knot. 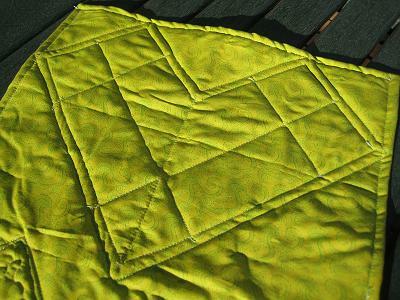 Basting a quilt is when you sandwich the quilt in three layers: the quilt top, batting and the backing. You need to baste these three layers together before doing the actual quilting. Here’s how to do it, 4 steps below! Update (added 5/02/11) – I also added a basting alternative at the end of this tutorial, which explains how to baste without using pins. The method is spray basting. 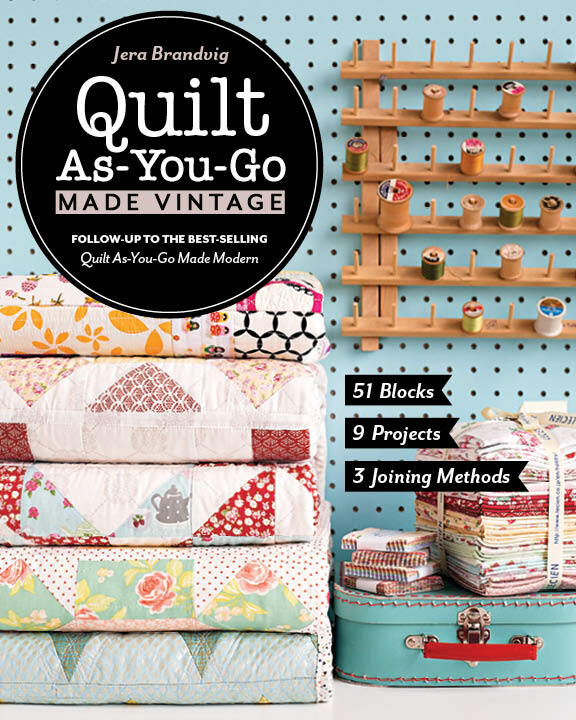 I’ve tried it before and would recommend it, especially for bigger quilts. 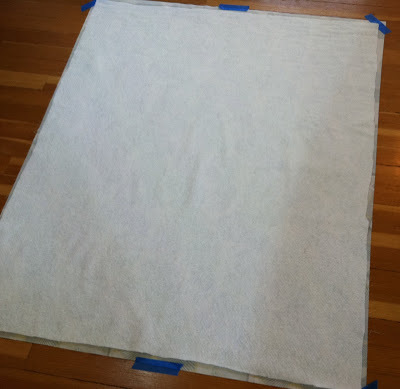 Step 1 – On a flat surface, lay your backing fabric flat on the floor with the right side facing down (the wrong side of the fabric will be facing you). Flatten out any bumps as best as you can (tip: it helps to use a yardstick or your 6″x23″ rotary ruler to help smooth out bumps). Tape the corners and sides as needed so that the fabric doesn’t shift around on the floor; I recommend using painter’s tape. 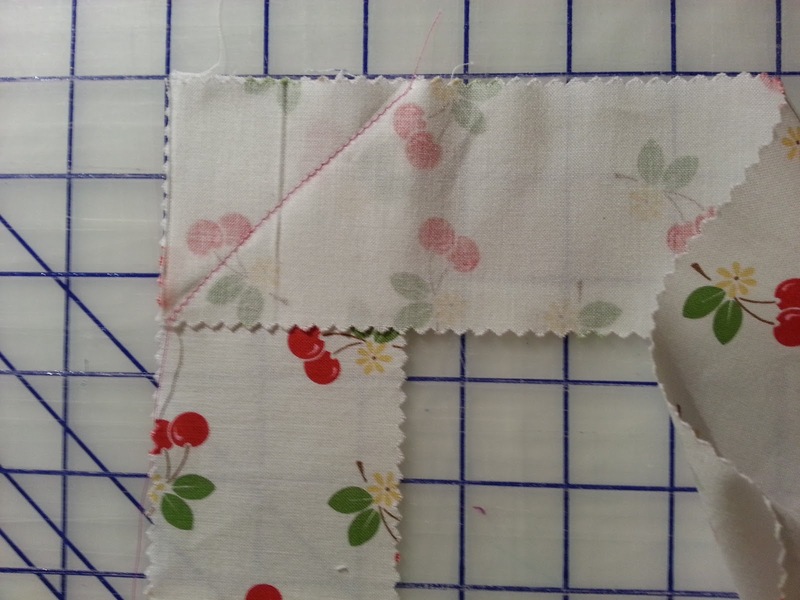 The backing fabric should always be at least 2-3″ bigger around the perimeter than the quilt top. 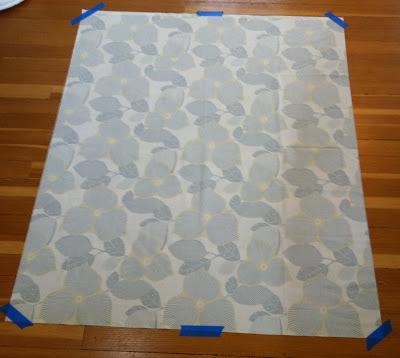 Step 2 -Next, lay your batting on top of the backing fabric. Flatten out any bumps as best as you can. 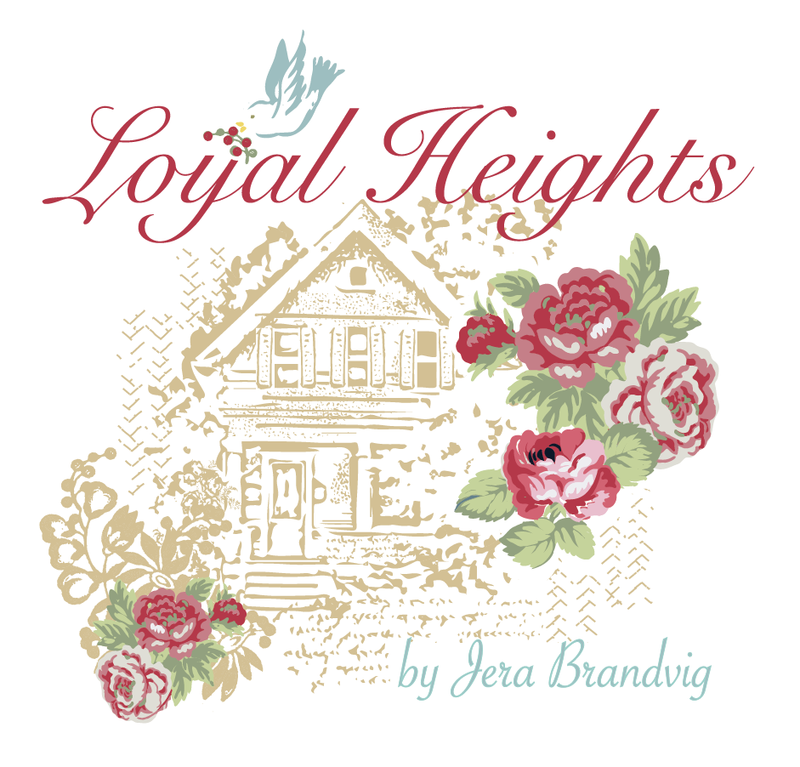 (Tip: I suggest using Warm & White cotton batting or Soft & Bright polyester batting. Both are made by “The Warm Company” and have almost a fleece-like feel to them, making them much easier to work with (i.e. you don’t have to deal with uneven batting that bunches while you’re machine quilting). However, if you are working with a fluffier batting, throw it in the dryer for ~10 minutes to help un-wrinkle it). Step 3 – Next, lay your quilt-top on top of the batting. 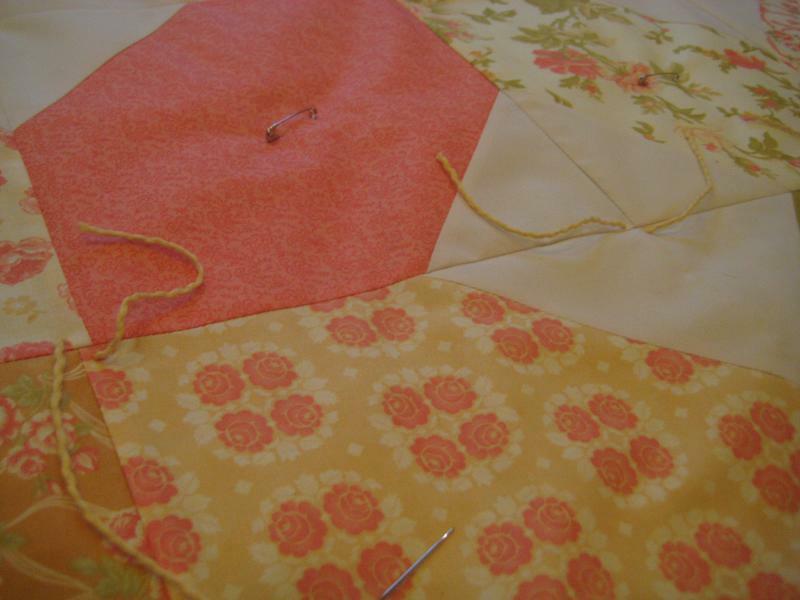 The right side of the quilt top should be facing you (the wrong side should be facing the batting). 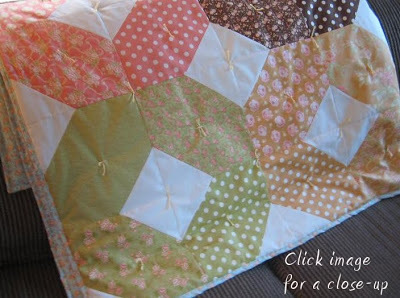 Make sure the quilt top is centered on the batting. Flatten out any bumps as best as you can. 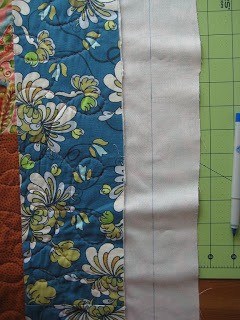 At this point, your quilt should be layered as shown below with the batting sandwiched in between the quilt top and backing fabric. This is called a quilt sandwich. 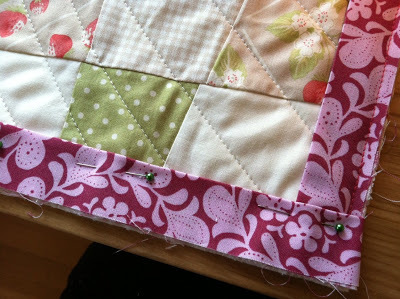 Step 4 – Now, you need to pin all three layers together to keep them in place so that they don’t shift around later while you’re quilting. 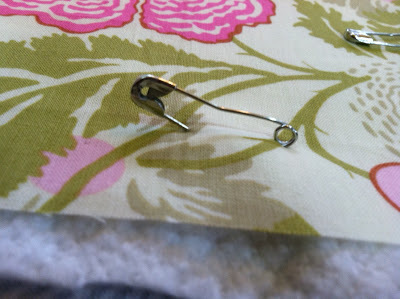 I recommend using curved safety pins, as shown below. The curve in the pin helps immensely when trying to pin through all three layers on a flat surface. Pin every 5-8 inches. 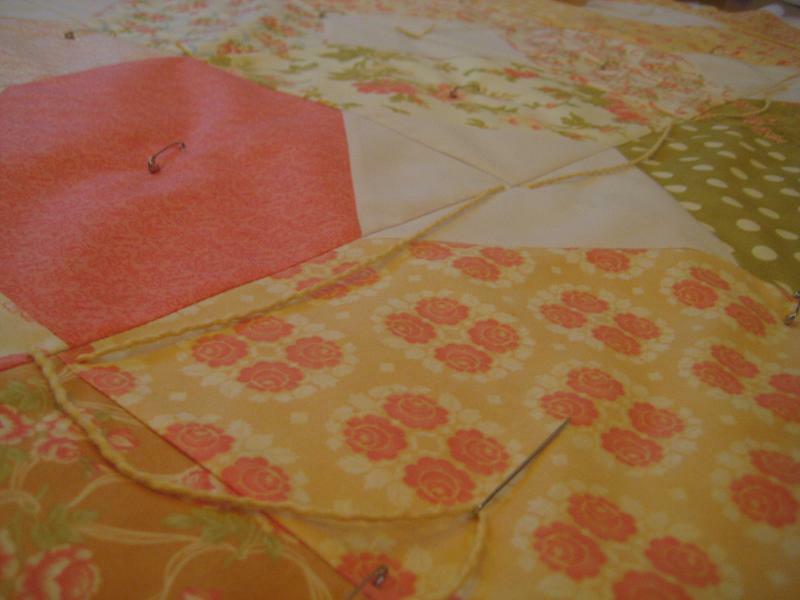 Start pinning on one end of the quilt. Remove the tape on one end, and start pinning every 5-8 inches. 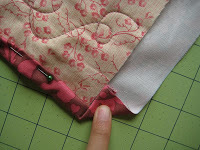 As shown below, roll the pinned quilt upward as you go for easier pinning access. That’s pretty much it. Let me know if you have any questions! I typically use pins (as explained above) to baste my smaller quilts; however, for the larger ones I would recommend spray basting them. Below are two video tutorials I found on YouTube that explain pretty well how to spray baste. In these videos, the gal spray bastes them by pinning the quilt layers to a wall so that all layers three layers drape evenly over one another. However, you can also spray baste on the floor (which is what I’ve done in the past). 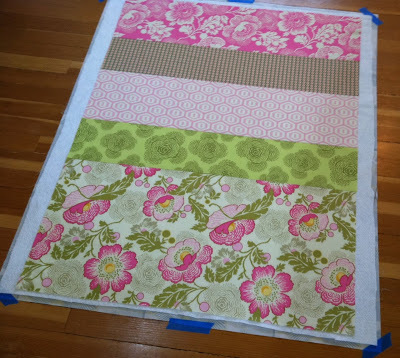 You just have to get down on all fours to make sure the layers are smoothed out evenly; it still helps to tape the backing fabric to the floor as described in step 1 above. Similar to the video tutorials, be sure to line your floors with newspaper around the quilt so you don’t get sticky floors. I recommend you watch this video first. Fast forward it to minute 6:15. 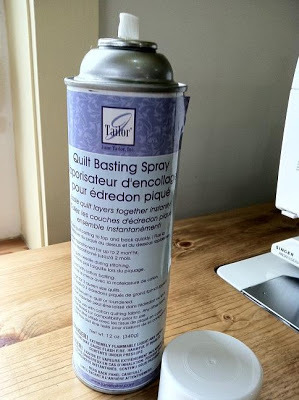 You can likely find spray basting glue at your local quilt shop or crafting chain store. Below is the brand (Tailor) that I’ve used. I’ve also heard the brand 505 is very good. 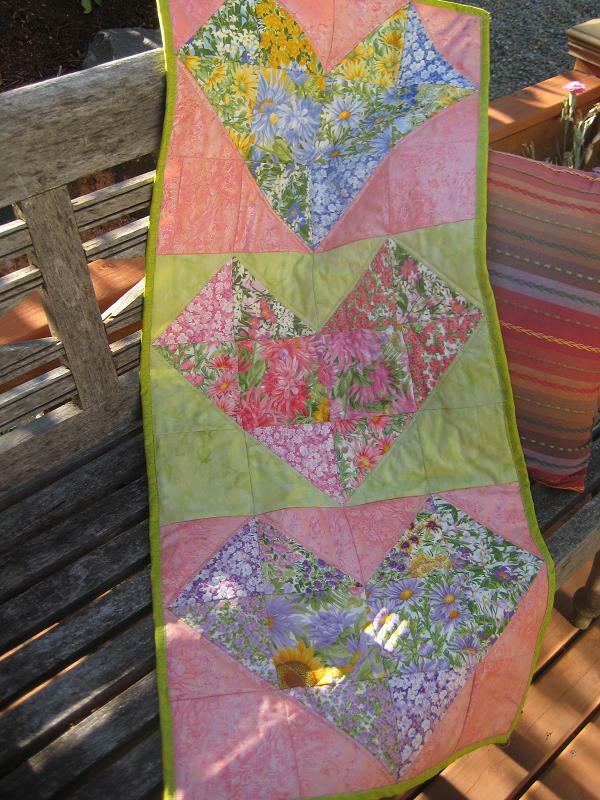 This is a wall-hanging quilt I finished last Saturday using scrap fabric and leftover charm squares. This quilt makes for a perfect example of various and simple ways to machine quilt (e.g. for this small quilt, I machine quilted this via straight-stitching, stitch-in-the-ditch, echoing, free-motion quilting). 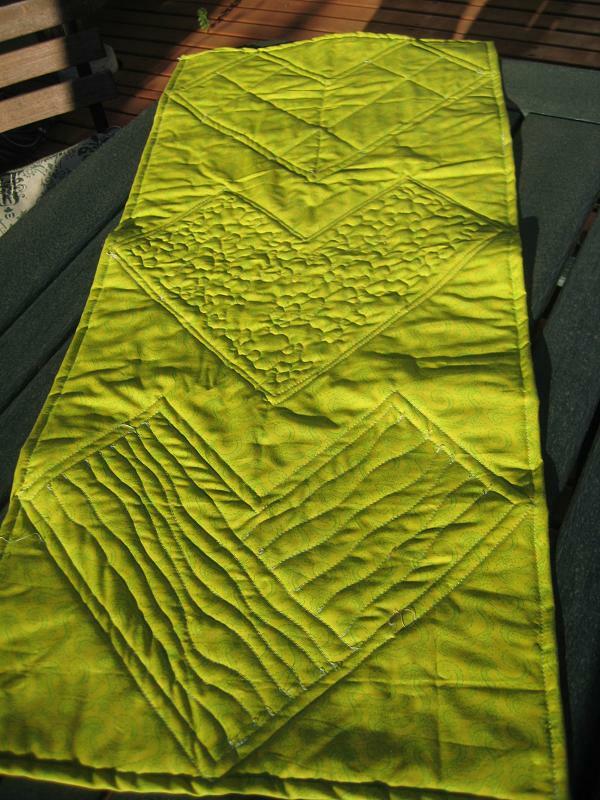 Here’s how the back looks like – you can really see the quilting in this lighting. 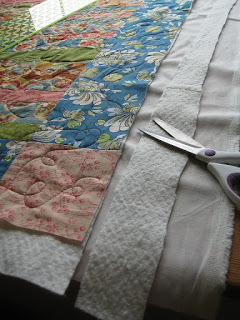 Stitch-in-the-Ditch: This is probably one of the easiest ways to quilt as it only involves straight lines. The placement of the stitch is in the pressed seams. In this photo I’m using a presser foot. All you have to do is decide what shaped you want outlined (or stitched in the ditch), and then go for it. 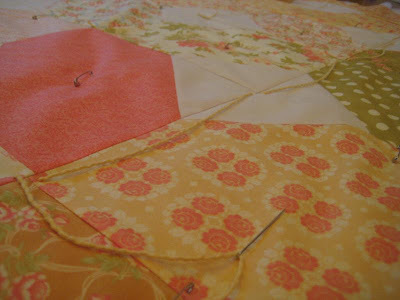 When deciding what shapes on your quilt top you want outlined, try to keep in mind how the back of the quilt will look. 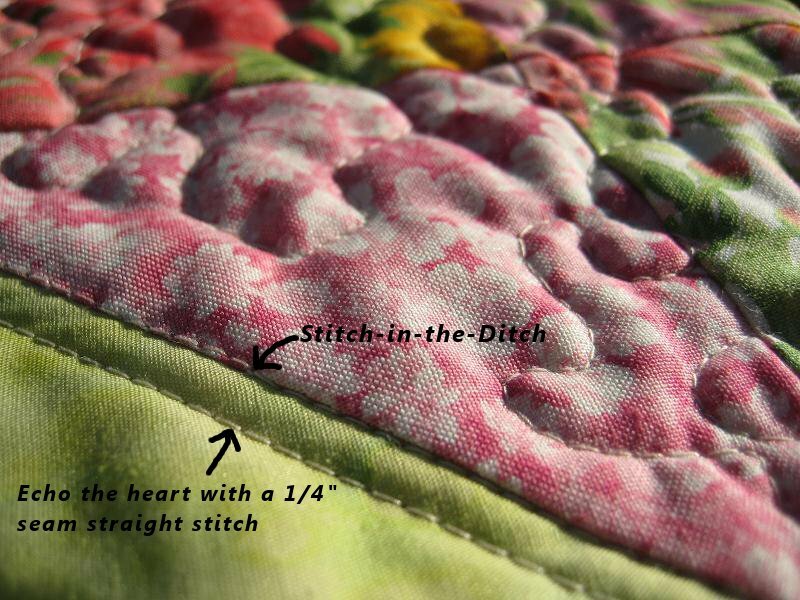 Echoing: After stitching-in-the-ditch, I then echoed the heart with a straight stitch using a 1/4″ seam. Again, I used a presser foot. 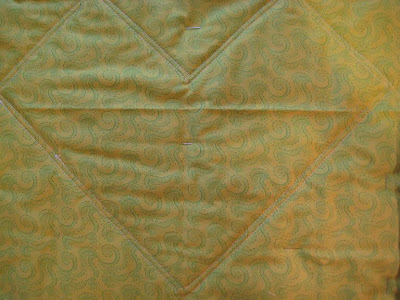 For the last heart, I quilted wavy-lines, still using a straight-stitch. I simply guided the quilt top in long, wavy motions underneath the presser foot. Free-Motion Quilting: For the middle heart, I used a darning foot (picture below). 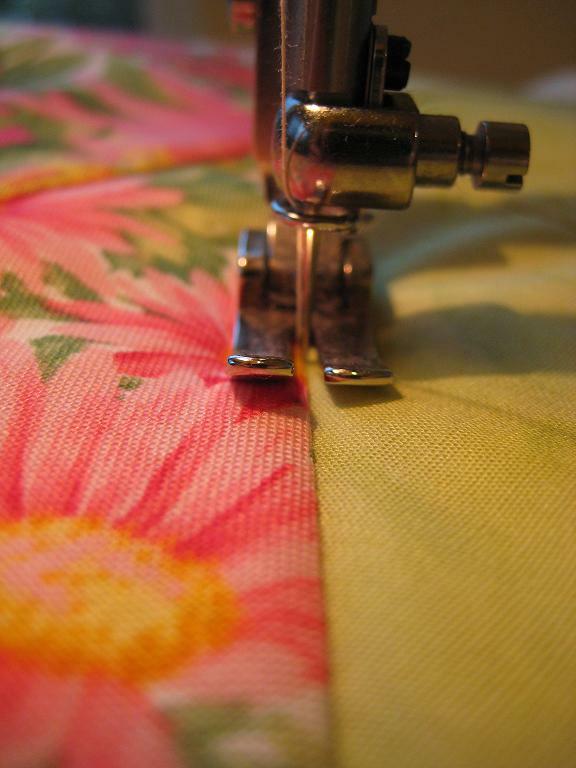 Follow your sewing machine’s instructions to replace the presser foot with a darning foot. Also, you will need to cover the feed dogs on your sewing machine (there should be instructions in your machine’s manual for that too). 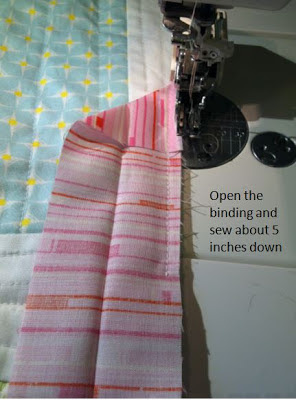 With free-motion quilting, you have total control of the movement of fabric beneath the needle because the feed dogs on your sewing machine are covered. On the contrary, when using a regular presser foot for straight-stitching the feed dogs are exposed (which is why you should never pull the fabric when straight-stitching, simply guide the fabric through). 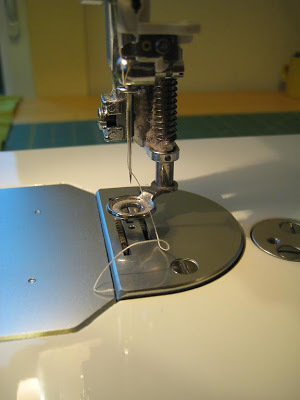 Maintaining a constant sewing speed and fabric movement under the needle will help you sew even stitches. 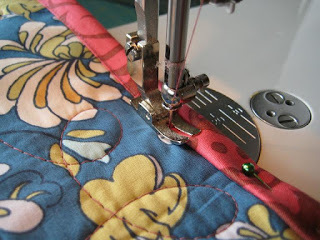 To secure a stitch, simply hold the fabric in place and sew several times in the same spot. This is basically the equivalent of doing a back stitch but with a darning foot. 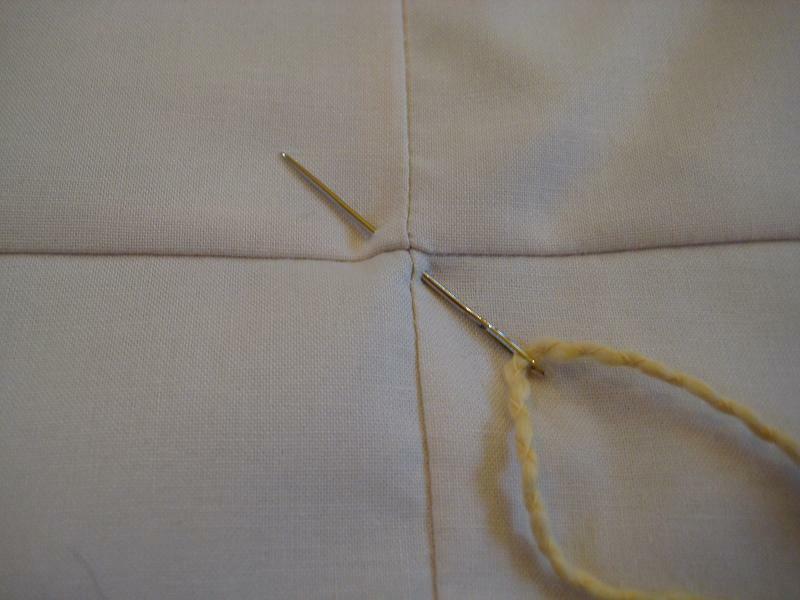 Do this when you start and end a stitch. 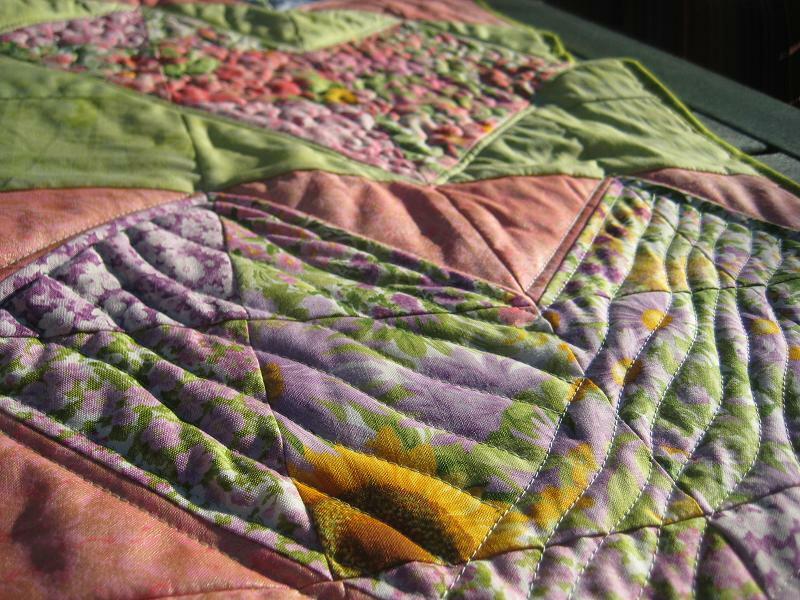 When free-motion quilting, it helps to choose a continuous pattern (i.e. loopy-loops or swirls). With the darning foot, I quilted free-motion stippling which is basically a bunch of squiggilies that never overlap (though i confess i messed up several times, you can see my mess-ups in the video below :-o). In this video I’m wearing what I call my Michael Jackson-Gloves, aka quilting gloves that have traction on the finger tips to help give me more control over the quilt top. You can get these at your local crafts shop; i can definitely tell the difference when i use them vs. not using them. 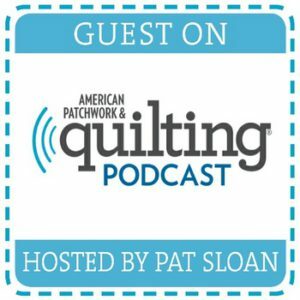 Anyway, for those of you that have never machine quilted and are thinking about it, I hope this gives you some helpful insight. Feel free to post any questions and I’d be happy get back to you. 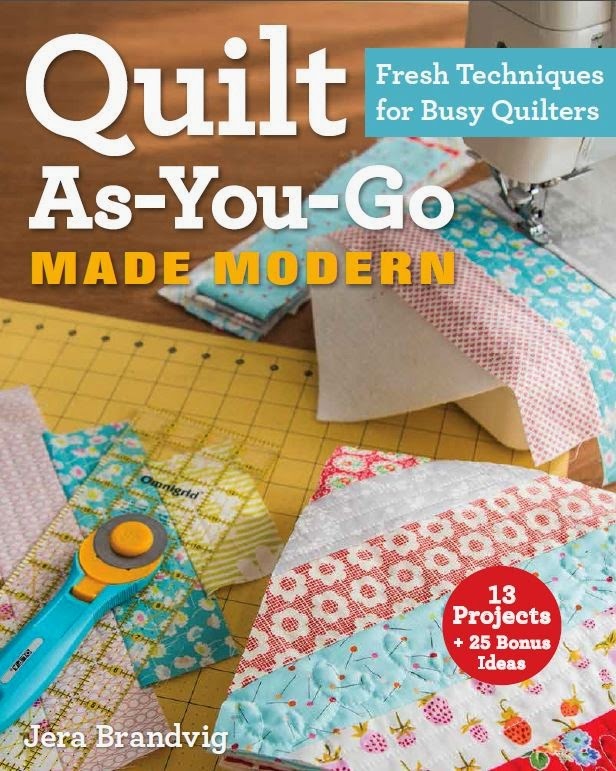 I’m no machine quilting guru, but i’d be happy to try help!